I have just taken over maintenance of a site which is running the Jupiter theme. It says that both WPBakery Visual Composer (Modified Version) (currently running 5.1.1) and Slider Revolution (currently running 5.4.2) need updating. However, if I try to do this I get failure messages. Also, vc_hoverbox does not seem to work. On pages where this has been used, there are no images, just the vc_hoverbox script. I assumne this is associated with Visual Composer itself not having been updated. If you’re using Jupiter 6.1.4 version, you can update WPBakery plugin via Jupiter > Control Panel > Required Plugins. As for the slider, its new version will be added in the next theme update. When I try to do this, it tells me that the plugins are already at the latest versions, even though it also shows that WP Bakery Composer is at 5.1.1 (and that 5.4.8 is available) and that Slider Revolution is at 5.4.2 and that 5.4.7.2 is available. Additionally, how can I tell what Jupiter version I am running? Please go to Appearance > Themes and click on “Theme Details” to check the theme version. Well, it is on 6.1.4, so any ideas on how I can update these plugins given the problems I mentioned in my last post? To update WPBakery plugin, go to Jupiter > Control Panel > Required Plugins and click “Update” button near it. The update for Revolution Slider will be provided in the new theme version. Yes, I know how to do it, but you’ll see from my earlier post that it tells me that the plugins are already at the latest versions, even though it also shows that WP Bakery Composer is at 5.1.1 (and that 5.4.8 is available) and that Slider Revolution is at 5.4.2 and that 5.4.7.2 is available. Can you show a screenshot where you see the message that the plugins are updated? Heer’s the one when I try to update WP Bakery. The message for Slider Revolution is the same. You shouldn’t update the plugin via Plugins section, you need go to Jupiter menu on the left side of your dashboard, click on Control Panel and select Required Plugins tab. If there is an update for a plugin, you’ll see “Update” button next to it. I have been going to the Jupiter menu and trying to update in the way that you say. I just showed you the screen grab of where it says the plugin is up to date, as you asked me to. Buty the fact remains that the plugins are telling me they need updates. Could you share the WP Login details?? Sorry for asking but are you from Artbees? Yes, Danish is a support agent from Artbees as I am. So please email him your login details via PM. Sorry for being stupid, but how do I do a PM? You can click on my profile and then look for any message button or envelope icon. I checked your site but when I tried to access the Jupiter Control Panel, it shows a blank page with a notice at the top to update the required plugins. I checked the console for the errors but I could see no error. This is weird. What I suggest is to deactivate all the plugins and then see if the Control Panel is showing up. If it still does not show, the I suggest re-installing the theme so that we bring back the Control Panel to it’s working state. 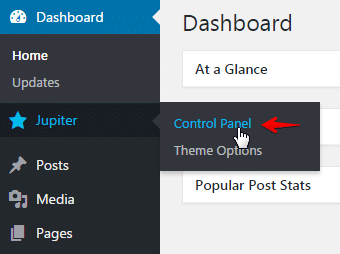 You can re-install/update via WordPress dashboard. The article covers updating Jupiter WordPress theme. There are several methods for updating theme and child theme including automatic update. After that, we can work on updating the plugins.